After a few honeymoon weeks, life has certainly increased it’s pace. The intensity of our Spanish classes has really picked up because of an increase in the time required to complete our assigned homework and the amount of material that we have to now memorize. Who would have thought Spanish had so many verbs and what’s up with all of those tenses? It can be a little discouraging but we both understand that until we can communicate with those we are here to serve, our usefulness is limited. Our confidence is growing every day as we speak with those we meet in the marketplace and on the streets. One final bit of good news on the Spanish front, we both killed our exams to move to the next grade and that definitely deserved a celebratory dinner. Another positive thing is that we are now able to go with our team every weekend to minister to the people in Escuintla. This has really been great for us because it gives us an opportunity to practice our Spanish, but more importantly, it gives us an opportunity to serve while we learn. Normally, on the weekends we will have a ladies ministry event followed by a general Bible study for the whole community. A couple of weeks ago, we decided to have a soup kitchen in addition to our other activities. Luis is our head chef and he always creates a tasty soup for the people and that Saturday was no different. The only problem with Luis’ soup this time was that it required the chopping of massive quantities of cilantro and by the end of the prep time, Lee Anne and I each had a blister on our finger. The blisters didn’t matter because the people really loved the soup and that is really all that matters. Finally, as if the month couldn’t be any better, a team from our home church arrived during the last week of September. We were able to take them to Escuintla to show them all the work that God has prepared for us. We were also able to spend the week with them working together in Santa Maria. It was such a wonderful blessing and I don’t think we realized how much we had missed them until we saw them again. It was actually kind of strange being on the other side of the mission trip equation, being a missionary instead of being on the team. All in all, a truly wonderful month that makes us expectantly look forward to what God has in store for us in the coming months. There is a reason why most missionaries don’t bring dogs to the mission field. It seems as though it’s much more difficult to move a dog to another country than it is to move two people. For instance, you need a USDA endorsed health certificate that is acceptable to both countries. In our case, Guatemala requires that this certificate be completed no more than 5 days before the departure date. Because of this we had quite the adventure getting Elly approved for her trip! We left Tulsa on Thursday and were visiting family in Texas, planning to leave out of Houston for Guatemala on the following Thursday. We made an appointment for Saturday morning with a vet in Athens, Texas, to examine Elly and fill out the necessary paperwork. The vet examined Elly, stated she was fine to travel, and we rushed off to FedEx the completed form to USDA headquarters in Austin. A short time later, we realized that our paperwork was incomplete! Naturally, we panicked and called the vet to see if he could see us on Sunday. He couldn’t, so we scheduled an appointment for 7:30 am Monday morning. He completed the form correctly this time, and since time was short, we decided to drive to Austin (a 3-hour trip) to hand deliver the form. Everything went well until I (Stephen) handed the second form to the USDA vet. It was then that she told me that the vet in Athens had filled the form out correctly, but it was the wrong form! Naturally, we panicked and raced back to Athens to get the correct form. Lee Anne called the vet as we drove back and explained the situation; the poor vet was so apologetic that it was kind of embarrassing. Needless to say, we double and triple checked the form before we left (again), and this time it looked perfect! Since we were in Athens and we hadn’t visited my parents’ gravesite in 8 years, we decided to visit the cemetary. As we were standing at their grave, a pickup pulled up and a young lady got out and walked quickly to the headstone next to my parents’. She knelt down and placed her hand upon the headstone. I felt the need to say something and so I asked her who she was honoring. She told us her name was Rhonda and it was her husband’s grave; he had been killed in a freak accident at work in March. We expressed our sympathy and asked if she had a good support system in place and if she had a church family to support her. She apologized, telling us that she didn’t have a church family because she has had to work 7 days a week since her husband’s death. As most of you know, I have a sensitive heart, and the Lord was prompting me to somehow show His love for her. I did the only thing I know to do in situations like this–I asked her if I could pray for her. She smiled and said that she would very much like us to pray, and we did, which brought tears to our eyes. The three of us hugged, then got into our cars and drove our separate ways. It occurred to us as we were driving away that if we hadn’t had the trouble with the USDA form and had to return to Athens, we wouldn’t have had the chance to meet Rhonda and show her God’s love. Isn’t it cool how God works? He takes our frustrations and headaches and turns them into opportunities to show others His love and give Him glory if we only have eyes to see. As many of you know, Lee Anne and I have been called to Guatemala as full time missionaries. We have been travelling to Guatemala regularly since 2012 with our home church, South Tulsa Baptist Church. God quickly made it clear to me that we were supposed to work there full time, and soon Lee Anne came to the same conclusion. We planned to move after I turned 55 in December 2016, but thank God, his plans are better than ours. 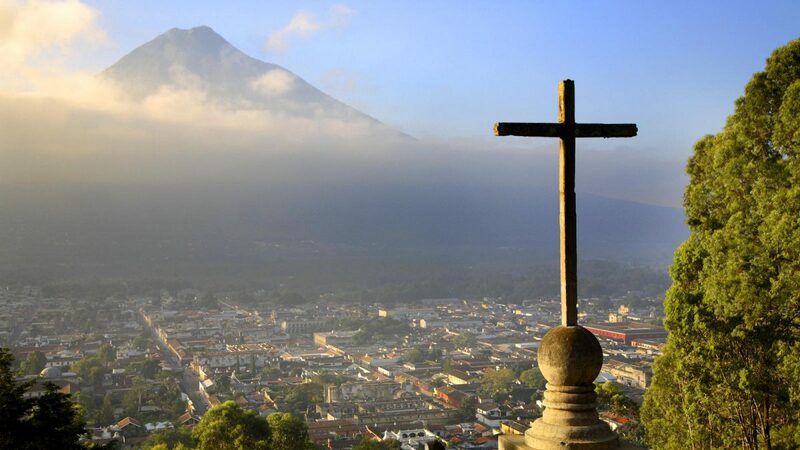 When I was laid off from my job in February it became clear that God wanted us to move sooner, so after much preparation, we will be leaving for Guatemala on August 25th. We are so excited to see what God has in store for us as we work to expand His kingdom in Guatemala. We will be working with BuildinGUATE, a ministry currently focused on two communities in Guatemala: a group of people living on a garbage dump just outside of Escuintla and another group in the tiny mountain village of San Martin. In Escuintla, our work will include feeding, teaching children’s Bible classes, leading adult Bible studies, skill training for the women, evangelism, home visits, medical clinics, and construction projects. In San Martin, we will primarily be assisting medical mission teams. BuildinGUATE eventually plans to build a community bath house with toilets and showers, a fully functional medical clinic, and a community center with classrooms and dorms for visiting mission teams in Escuintla. Please specify that the funds are for “Mission Associate – Guatemala – SG”. For tax reasons, our names cannot be written on your check. Last, please pray for God to reveal how you can serve in missions, too. It may be moving overseas, serving on short-term teams, creating a neighborhood Bible study, or being a prayer warrior. We are still all called to glorify God by telling people the Good News of Jesus Christ. If you would like more information on BuildinGUATE, you can read about us at www.buildinguate.com or at our Facebook page, BuildinGUATE. Griffins in Guatemala Blog at WordPress.com.